Part 2 of the Winter stockpile by Greg Judy published to “On Pasture” online magazine. Should you get rid of your endophyte-infected tall fescue? Greg shares why we don’t like it, and why getting rid of it may be hard on us too. This is the second in a four part series. Here’s Part 1. Our winter stockpile consists mostly of endophyte-infected Kentucky 31 fescue. This fescue is the most cursed despised grass in the Midwest for several reasons. 1. The endophyte restricts the blood flow to the extremities of some animals, causing some cows to lose tail switches, feet, ear tips. 2. Low weight gains, lower reproduction rates. 4. Summer slump, plants stop growing in extreme heat. There are practices that you can use to kill endophyte-infected fescue on your farm and replace it with the novel friendly endophyte fescue. This novel endophyte is more palatable and livestock can perform better on it. I have no argument that the novel fescue is better forage, but the cost of converting your farm over to the novel is something to consider. You have to spray the present endophyte infected fescue pasture in the spring with Roundup. This is followed by drilling some kind of summer annual crop into the sprayed area. Then you need to re-spray this same area again in the fall to ensure you killed all the fescue plants that survived the spring roundup spraying. Then you drill the new novel endophyte fescue into the killed sod. 1. When you spray Roundup on your pastures and kill the present stand of fescue, what are your cows supposed to eat that year if it doesn’t rain and the summer annual crop fails? 2. What if it doesn’t rain that fall after drilling the new fescue? Now you are really stuck with a failed grass seeding, bare ground, winter coming and no pasture for your livestock. It’s going to be a long winter feeding hay and no spring grass to look forward to. 3. It will take several years to build enough sod under the new plants to hold up livestock in a rainstorm. 4. The cost of the seed for the new improved fescue will average around $100 per acre with no guarantee of getting a stand of grass. 5. Roundup herbicide cost, spraying, fuel, labor, equipment, no grazing, all add up to another $175/acre. 6. Can the new fescue take a beating like the endophyte infected fescue and maintain a stand to support your livestock? If you want to try the new fescue, plant a small plot first on your farm to see if it persists with grazing pressure. 7. You cannot feed any purchased hay onto this new stand of novel fescue if it contains Kentucky 31 fescue. 8. Finally, if you have endophyte-infected fescue on the borders of your pastures, will it come back? If it does, will you have to go through this whole process over again in five years? Those are a whole bunch of what if’s that may not work out the best for my pocket book at the end of the day. I also feel like every second that my rear end is plopped on a tractor seat, I am losing money. How about approaching the endophyte infected fescue problem from a different angle – one that will keep the money in everyone’s pocket while allowing us to make a living on our farms? In Part 3, I’ll share what we have undertaken on our farms with management of our cow herd and grazing to prosper on this dirty endophyte-infected fescue. Some folks say we should do all we can to get rid of Kentucky 31 fescue in our pastures. But Greg Judy has other ideas. In this four part series he covers his experiences, good and bad, with this grass, and why he’s keeping his. He starts with the basic benefits of winter stockpile. When folks start investigating methods of shortening the winter hay feeding periods on their farms and ranches, the term “winter stockpiling” is usually found somewhere in the discussion. 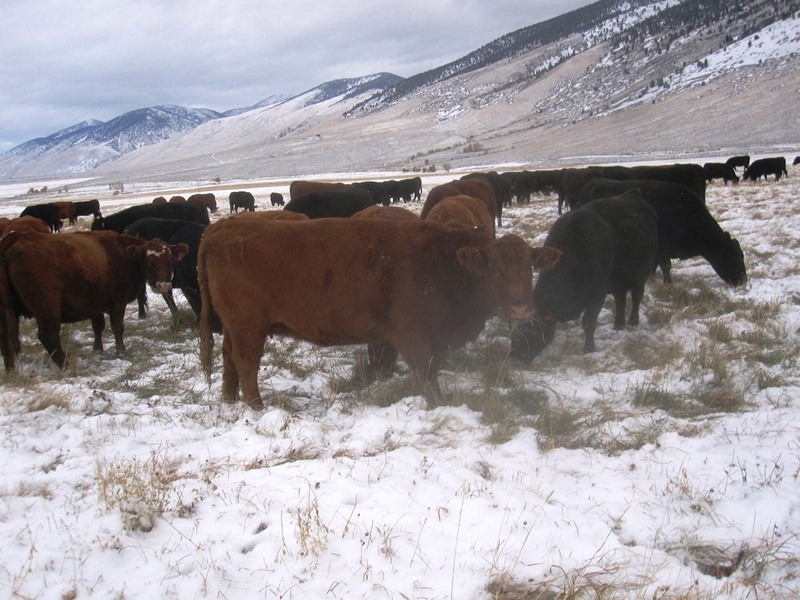 The term “winter stockpiling” means that you are allowing your grass to grow on your farm in the fall growing season without being eaten off by your livestock. This fall grown grass (stockpile) is reserved for winter grazing by animals in the dormant non-growing season. The only equipment required to harvest this fall grown forage in the coming winter is the four-legged kind along with some electric fence. The animals harvest it right off the stem where it was grown. Grazing winter-stockpiled fescue ranks as one of the highest money savers there is on our livestock farms. Once you have succeeded in growing all this fall growth of grass this is your standing hay for the coming winter. Our winter stocking rate is based on how much stockpiled fescue we have available across the various farms. Cows really enjoy grazing every day they possibly can. They would much rather be peacefully grazing across the pasture in the winter, rather than standing in deep mud around a bale ring fighting off other cows. All the fertilizer benefits from the bale-ring-fed hay are being deposited around the bale ring where the ground has been trampled into a mud slurry. Once the sod around the bale ring is pugged with deep holes through the sod, this area is guaranteed to grow a good healthy crop of weeds for years to come and it years to heal before it will ever grow grass again. 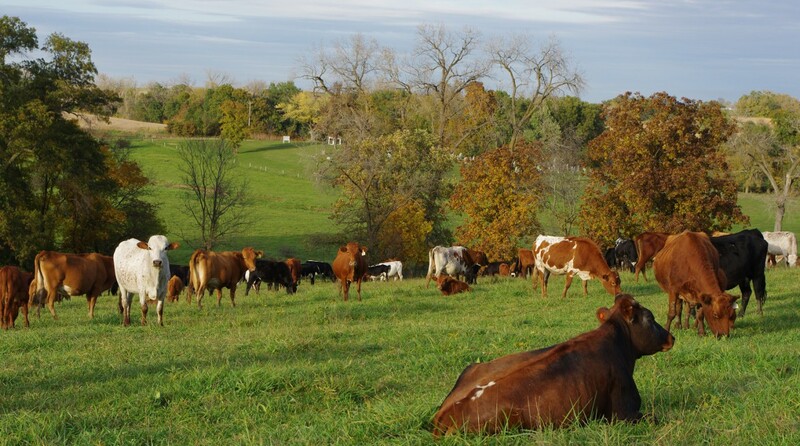 Not only is it an eyesore on your pasture, it is no longer a productive area on the farm. If you have to feed hay to your animals, unroll it across the pasture to spread out the fertility. One conventional mindset that is tough to get changed is that when winter arrives, animals cannot feed themselves on our pastures anymore. People think, “You must feed hay or your animals will not survive.” My question to that line of thinking is, “What did animals eat for centuries before we started making and feeding them hay?” It’s pretty obvious that they survived without hay and they reproduced too. I’ve learned that when winter arrives animals are more than happy to graze if they are moved to fresh grass every day or so. The more often I move them, the better they perform and the more content they are. Our mob of cows depends on us moving them daily, they are unhappy campers if they don’t get their daily fresh paddock of stockpiled grass. By focusing on growing grass on our farm with full recovery periods between grazing, we can let the animals harvest the grass where it is grown. The manure pats and urine patches that are deposited while grazing are dropped where they belong – on our pastures where they will grow more future grass. We have learned to trust our grass that is standing in our pastures to feed our animals. It does not need to be rolled up in a bale to be good feed. Many times rolling up hay into bales makes it worse feed. Unless you get perfect drying conditions to cure the forage, you end up with moldy hay that is great to fill a ditch with. Animals would much rather harvest fresh grass on the stem. Here’s a 55 second video from Greg showing his cattle grazing stockpile. 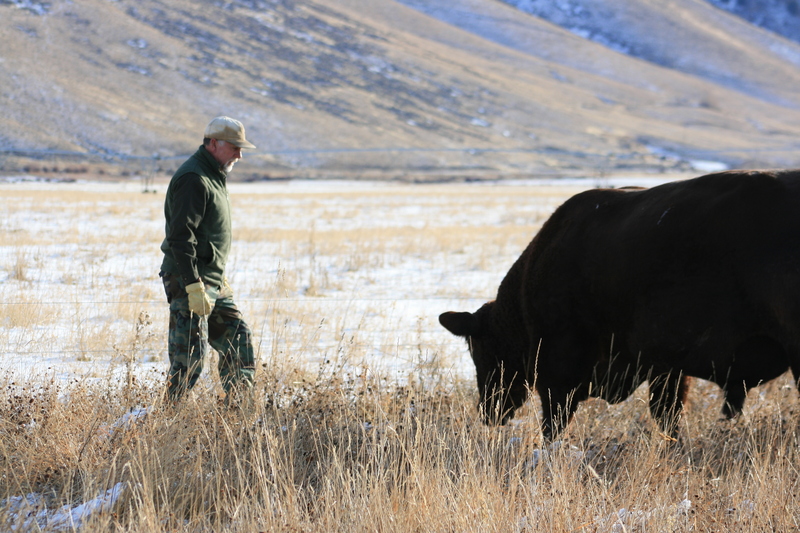 He’s passionate about this and covers it in his grazing school every May. Here’s Part 2 in the series. My new rubber boots arrived today and none too soon. Nearly every time i wore them this past year, my feet got wet. (which was a lot because it has rain incessantly except for Sept and October so we had absolutely NO fall regrowth for winter stockpile pastures). We are getting some Scottish weather albeit a bit colder. The old ones are probably at least 12 years old and basically leak because they have cracked and dry rotted at the ankles where they bend. LaCrosse brand has been my go-to for 30 plus years. Hopefully, these new ones will last as long, but they do seem to be slightly less quality and a bit differently shaped in the foot. Made in China – too bad. But they fit nicely, so I am encouraged that they will live up to their historical quality. Depending on weather conditions, it’s quite likely our cows may need some energy. What we are concerned about is the lack of green in any of our stockpile which, from what we read, can result in a serious lack of Vitamin A. We are looking into supplementing that since the lack of this important vitamin results in expensive compromises to animal health.